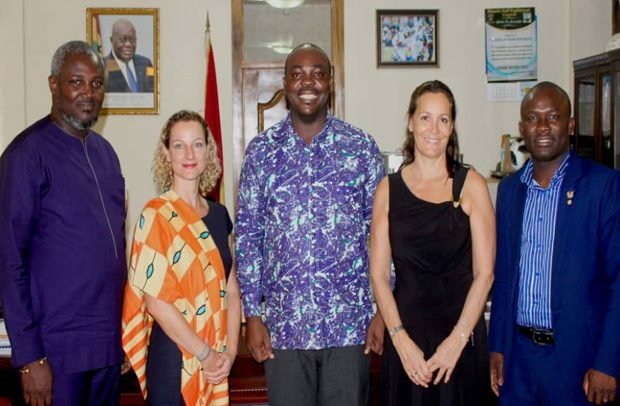 The French Ambassador to Ghana, H.E Anne Sophie Ave has paid a courtesy call on the Minister for Youth and Sports, Hon. Isaac Kwame Asiamah to discuss issues towards the development of youth and sports in Ghana. In her remarks, the ambassador emphasized on the importance of volunteerism, highlighting the importance of African players, specifically Ghanaians, who plied their trades at French clubs. She further disclosed that the Embassy is undertaking a project where volunteers will be sent to the country to teach individuals and organizations the basics in French language. Her Excellency Ave took the opportunity to invite the Hon. Minister for a sports competition slated for May 10, 2019 which includes six schools from Ghana between the ages of 8-12years in different sporting disciplines. The Sports Minister said his outfit fully supports the project and would contribute its quota to make it a success adding that as part of its mandate, it strives to use sports as a tool for job creation and crime prevention as well as developing young talents. “The Ministry is partnering with the Ministry of Education and other key stakeholders towards the revival of school sports,” said the Minister. He added that a Committee has been inaugurated to revive school sports and it is spearheaded by his deputy, Hon. Perry Okudzeto to ensure that it comes into fruition as it falls under part of his government’s mandate. The Minister lauded the French government for initiating the volunteerism project and called on them to support school sports. Present at the meeting were the Deputy Minister for Youth and Sports, Hon. Perry Curtis Kwabla Okudzeto, Chief Director of the Ministry, Mr. Frank Quist, Director General of the NSA, Prof. Peter Twumasi, Technical Advisor of the Ministry, Dr. Emmanuel Owusu-Ansah, Communications Consultant, Mr. Ahmed Osumanu Halid, Monitoring and Evaluation Coordinator, Nana Adwoa Adutwum and Directors of the Ministry.